1Pharm D. College of Pharmacy, Ziauddin University, Karachi, Pakistan. 3Assistant Professor, Department of Pharmaceutics, University of Karachi, Karachi, Pakistan. Khan AB, Khan MU, Shoiab MH, Yousuf RI, Mir SA. Practice Nurses and Pharmacists: A Perspective on the Expectation and Experience of Nurses for Future Collaboration. Oman Med J 2014 May; 29(4):271-275. Objectives: To explore the nurses’ expectations and experience about pharmacists in private sector hospitals of Karachi, Pakistan. Methods: A cross-sectional study was conducted from June to September 2012 in five private sector hospitals of Karachi, Pakistan. A convenient sample of nurses (n=377) were enrolled in this study. Data was obtained through a previously validated questionnaire. Responses were statistically analyzed using SPSSv.17. Results: Questionnaires were returned giving a response rate of 63.6% of which 20 were unusable (n=240). Out of the remaining 220, 24.1% (n=53) responded that they never or rarely interacted with a pharmacist. Respondents who expect pharmacists to collaborate with nurses to solve drug related problems were 45% (n=99). Nurses’ experience of pharmacists was not substantial as only 44.5% (n=98) respondents consider pharmacists as a reliable source of clinical drug information. Conclusion: The role of pharmacists is not well appreciated among nurses in Pakistan. Hence, pharmacists must bridge the observed gap and use a more strategic and consistent approach to build a more positive image in line with other healthcare professionals and in providing patient-centred pharmaceutical care. This research would impress upon the pharmacists the need to redefine their role in the healthcare settings. Keywords: Pharmacist; Nurse; Perception; Healthcare. The need to improve patient care has become a topic of increasing interest in the healthcare community throughout the world.1 Due to the increase in demand of healthcare services, healthcare system faces an increasing number of demanding factors such as limited resources, increase healthcare cost and rising public expectations.2 Inter- professional collaboration among various disciplines of healthcare settings can significantly enhance patient care.3 Over the past few years, pharmacists have begun entering into this collaborative relationship by means of integrating their services with other healthcare professionals.4 Various researchers have reported that physician-pharmacist collaboration has helped in achieving the improved clinical outcomes and optimized patient care.5,6 However, the focus has always been on exploring the relationship between physician and pharmacist while the debate of nurses-pharmacist collaboration has always remained undercover. In a developing country like Pakistan, healthcare system is not well established as in developed countries. The healthcare system still faces many barriers like financial constraints, scarcity of qualified staff and lack of standard practicing guidelines. Nurses are an important part of the healthcare setting in Pakistan. (One of the) most important responsibility of the nurse is the administration of medications to patients.7 During this procedure, the nurse should be in collaboration with the prescriber, who orders the drug for the patient and the pharmacist who provides the drug.8 According to the WHO international standards, the ratio of doctors to nurses should be 1:3; however this is reversed in the case of Pakistan, i.e. the ratio of doctors to nurses is 3:1.9 Unfortunately no such data are available for the pharmacist-nurse ratio in the country. Recently, private sector hospitals of Pakistan have extended pharmaceutical care services to enhance rational mediation use. However such innovations can only be fruitful if pharmacist works as part of multidisciplinary health team involving also the physician and nurse. The aim of this study was to explore the expectations and experience of nurses regarding the role of pharmacist in the private sector hospitals of Karachi, the largest city of Pakistan. A cross-sectional study was conducted from June through September 2012. Study participants included nurses from 5 different private sector hospitals of Karachi, the most populated city of Pakistan. A total of 377 nurses were selected for this study. The sample size was calculated by using Raosoft sample size calculator by keeping the margin of error as 5%, confidence interval as 95%, population size as 20,000 and response distribution as 50%.15 Convenient sampling technique is used to select a sample. The questionnaires were distributed by the investigator responsible for data collection by meeting in person with the participants. A brief background and the objective of the study were explained to the participants followed by a written consent to participate in the study. The questionnaire was adapted from the study instrument which was validated and used for a research study in Kuwait.16 A detailed discussion was conducted among the researchers and their opinion on the questionnaire were taken into consideration with respect to its relativity, simplicity and importance. In the next step, the same procedure was repeated by selecting a small group of participants (n=20). Suggestions from participants were noted and incorporated to make the questionnaire more simple and brief. After assessing the similarities and differences in responses at each occasion, necessary changes were incorporated and the validity of the instrument was then ascertained after a brain storming session by the researchers. The questionnaire was segregated into five sections. Section one elicited the demographic information of the study participant such as gender, place of work, current position, years of experience and area of practice. Section two consisted of information regarding the frequency of interaction of nurse with pharmacists. Three options were given to the participant in this section namely, never/rarely, once a week and once a day. Section three queried the participants about the reason of their interaction with the pharmacist. Section four highlighted the expectation of the nurse from a pharmacist. This section had six questions and the respondents were asked to indicate the level of agreement using a 4-point Likert scale namely, strongly agree, agree, disagree and strongly disagree. 4-point Likert scale was used to avoid confusion with the neutral answers. Section five measured the actual experience of the nurse dealing with the pharmacist. This section had eight questions and, again, the level of agreement was shown by the respondents using the 4-point Likert scale. The data was analyzed utilizing Statistical Package for Social Sciences (SPSS version 17, SPSS Inc., Chicago, IL, USA). Descriptive and inferential analysis was carried out. . The results of each item on the questionnaire were reported, as percentages and frequencies. Chi-square test was utilized to test the important relationship between the independent variables (age, gender, current position and current area of practice) and dependent variables (expectations and experience). Statistical significance was accepted at p value of <0.05. The study protocol was approved by the institutional research ethics committee. Furthermore, written consent was obtained from the respondents prior to participation in the study. Two hundred and forty questionnaires were returned of the total three hundred and seventy seven administered, giving a response rate of 63.6%. However twenty questionnaires were discarded because of the failure to comply with the given instructions. Analysis was carried out on the remaining two hundred and twenty questionnaires. The demographic information is summarized in Table 1. Majority of the participants were female (69.1%, n=152) and were associated with general hospitals. 64.5% of nurses graduated from private nursing colleges (n = 142) and most of them had an experience of less than five years (60%, n=132). More than half of the study participants were working in Medicine department (55.4%, n=122). A total of (24.1%, n=53) respondents revealed that they never or rarely interact with pharmacists (Table 2) while, of those who interacted, majority of them had an interaction on daily basis (57.2%, n=126). 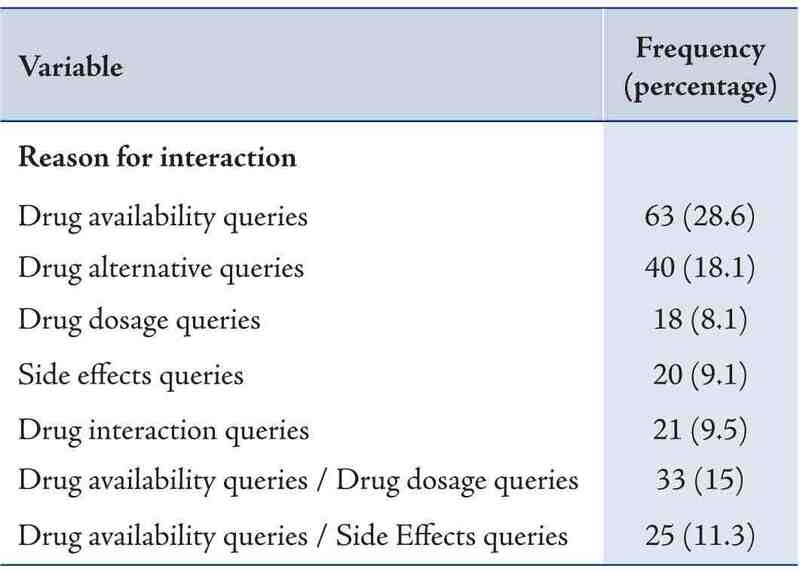 The major reason of interaction reported by most of the nurses was to query drug availability (28.6%, n=63) while only 8.1% (n=18) interacted with pharmacist regarding drug dosage queries Table 3. Table 1: Nurse’s Demographic Information. Approximately half of the nurses (50%, n=111, p<0.05) strongly agreed that they expect pharmacist to play a vital role in enhancing their knowledge in solving drug related problems (Table 4). Similarly 45% (n=99) of the respondents strongly agree to the statement that pharmacist should collaborate with nurses to solve drug related problems and a positive significant relationship was observed between this expectation and the years of nursing experience (p<0.050). On the contrary, 9% (n=19) strongly disagree to the point that pharmacists must take responsibility for the pharmacotherapeutics outcomes. When asked about their experience, nurses (63%, n=138) agreed that pharmacists are professional drug experts while 21% (n=46) strongly agreed to this statement. Gender, Current position and practice were significantly associated with this experience (p<0.050) Table 5. Nurses experience with pharmacists was not up to par as less than half of the participants strongly agreed that pharmacists are reliable source of clinical drug information (45%, n=98, p<0.050). Table 2: Frequency of Interaction. Table 3: Reasons for Interaction. Table 4: Nurses Expectation from Pharmacist. Table 5: Nurses Experience of Pharmacist. Nurses however do expect pharmacists to be an expert in drug related area as approximately half of the respondents (50%) in the current study, strongly agreed to this statement. However, their expectations contradict their experience, as only 21% participants strongly agreed that pharmacist is a professional expert on drugs. The possible reason of this contraindication could include the lack of opportunities available for pharmacists to prove their expertise to other healthcare professionals in drug related area. The other probable reason is that the healthcare system in Pakistan does not allow pharmacists to fulfil their clinical responsibilities in hospital due to which nurses’ are hesitant in accepting pharmacist as the professional expert on drugs. This argument is supported by the study of Azhar et al20 which revealed that 85% and 56% of the hospital pharmacists have limited their role to the maintenance the pharmacy record and just to filling the medication respectively. Another study21 which investigated the expectation of nurses showed that they want pharmacist to review the prescription and make necessary interventions, if required, for the betterment of the patient care. This shows that nurses are quite optimistic in their expectation about pharmacists, as 91% of respondents agree or strongly agree to this point in this study also. This result is also supported by the study conducted in US a based trauma centre (Fairbanks et al.22) where 76% of the nurses accepted that prescription orders must be checked by pharmacist before they are carried out. Large group of nurse (84%) responded that they expect pharmacist to take responsibility of the pharmacotherapeutics outcomes. These findings are in parallel with the study by While et al.23 which described the health professionals’ views regarding interdisciplinary working in primary care. Nurses’ experience of pharmacist regarding the provision of clinical drug information was below par as 28% of respondents disagree or strongly disagree to this statement. A possible factor for this is the shortage of qualified clinical pharmacists in Pakistan. The field of clinical pharmacy is comparatively new in Pakistan and even now universities are in the phase of establishing this specialized department Khan et al.24 Nurses (83%, agreed or strongly agreed) were willing to incorporate the pharmacotherapy in consultation with the pharmacist. This result also matches with their expectation as most of them expected pharmacist to be involved in optimization of the prescriptions through recommendations. These findings are also supported by the study Hughes and Lapane25 where nurses were open in accepting the pharmacist’s intervention in nursing homes. 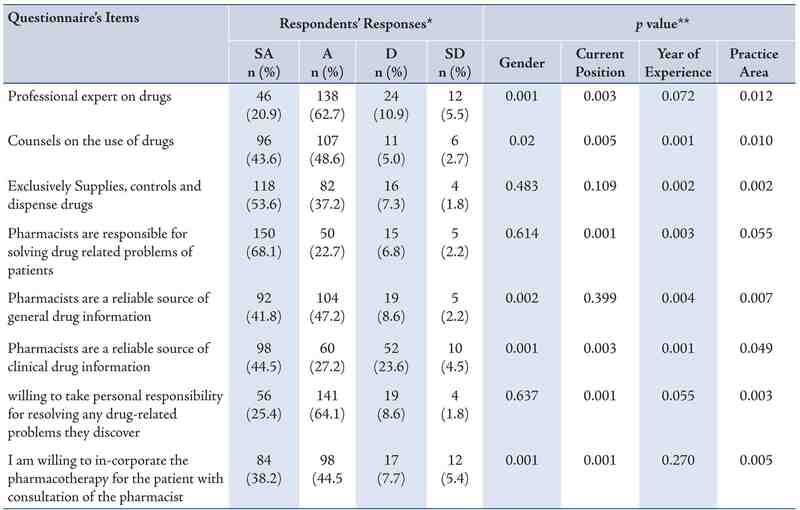 Interestingly, only 25% of the participants strongly agreed that pharmacists take personal responsibility to resolve any drug related problems. This again shows that the clinical knowledge of pharmacist is quite weak and pharmacists lacks the confidence required to take decision at the patient bed side and hence avoid taking the responsibilities. Overall, the expectation by nurse about pharmacist does not match with their experience. Hence, there is a need for Pharmacists to enhance their clinical expertise and redefine their role in healthcare setup of Pakistan. At the same time, policy makers and other health authorities must also step in to highlight the importance of the role of the pharmacist and promote pharmaceutical care services in Pakistan. This study had few limitations. Firstly, use of convenient sampling could have resulted in inadequate representation of nurses from private sectors hospitals. Secondly, the response rate of 63.6% could affect the validity and reliability of the study. 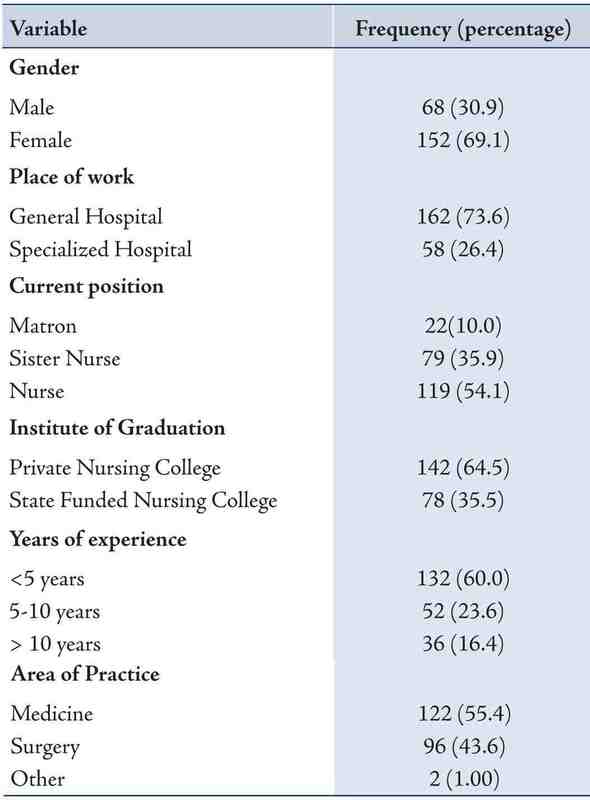 This study highlighted that the current perception of nurses regarding the role of pharmacist is not optimal in private sector hospitals of Karachi, Pakistan. Expectation by nurses that the pharmacist should be an expert in drug related area was below par. Nurses’ experience of pharmacist was also negative as this study showed that nurses did not find pharmacist as a useful source of clinical drug information. This should stimulate pharmacists to redefine their role in the healthcare settings and to promote collaboration with other healthcare professionals for the betterment of the patient and the society. Perhaps it is time to communicate this message to the Pharmaceutical society in Pakistan and around the world to use a more strategic approach to build up a positive image in line with other healthcare professionals by providing patient-centred pharmaceutical care. 1. Hobson RJ, Scott J, Sutton J. Pharmacists and nurses as independent prescribers: exploring the patient’s perspective. Fam Pract 2010 Feb;27(1):110-120. 2. Azhar S, Hassali MA, Ibrahim MM. Perceptions of Hospital Pharmacist’s Role in Pakistan’s Healthcare System: A Cross-Sectional Survey. Trop J Pharm Res 2011;10:11-17. 3. Reeves S, Lewin S. Interprofessional collaboration in the hospital: strategies and meanings. J Health Serv Res Policy 2004 Oct;9(4):218-225. 4. McDonough R, Doucette W. Developing collaborative working relationships between pharmacists and physicians. J Am Pharm Assoc 2001;41:682-692. 5. Irons BK, Lenz RJ, Anderson SL, Wharton BL, Habeger B, Anderson HG Jr. A retrospective cohort analysis of the clinical effectiveness of a physician-pharmacist collaborative drug therapy management diabetes clinic. Pharmacotherapy 2002 Oct;22(10):1294-1300. 6. Kiel PJ, McCord AD. Pharmacist impact on clinical outcomes in a diabetes disease management program via collaborative practice. Ann Pharmacother 2005 Nov;39(11):1828-1832. 7. Armitage G, Knapman H. Adverse events in drug administration: a literature review. J Nurs Manag 2003 Mar;11(2):130-140. 8. Köse G, Subaşi U, Gatipoglu S, Lenk H, Gonul E. The importance of “patient-nurse-physician-pharmacist” collaboration on drug administrations. Marm Pharm J 2012;16:115-119. 9. Akram M, Khan FJ. Healthcare services and government spending in Pakistan. Pakistan Institute of Development Economics 2007;32. 10. Babar ZU. Pakistan National University of Pharmaceutical Sciences. Am J Pharm Educ 2006;70:123. 11. Fletcher J, Hogg W, Farrell B, Woodend K, Dahrouge S, Lemelin J, et al. Effect of nurse practitioner and pharmacist counseling on inappropriate medication use in family practice. Can Fam Physician 2012 Aug;58(8):862-868. 12. Horsburgh M, Lamdin R, Williamson E. Multiprofessional learning: the attitudes of medical, nursing and pharmacy students to shared learning. Med Educ 2001 Sep;35(9):876-883. 13. Azhar S, Hassali MA, Ibrahim MM. Doctors’ perception and expectations of the role of the pharmacist in Punjab, Pakistan. Trop J Pharm Res 2010;9:205-222 . 14. Shane R. Current status of administration of medicines. Am J Health Syst Pharm 2009 Mar;66(5)(Suppl 3):S42-S48. 15. Raosoft: An online sample size calculator. 2004. Accessed January 2013. Available from: http://www.raosoft.com/samplesize.html. 16. Matowe L, Abahussain EA, Al-Saffar N, Bihzad SM, Al-Foraih A, Al-Kandery AA. Physicians’ perceptions and expectations of pharmacists’ professional duties in government hospitals in Kuwait. Med Princ Pract 2006;15(3):185-189. 17. Rose L. Interprofessional collaboration in the ICU: how to define? Nurs Crit Care 2011 Jan-Feb;16(1):5-10. 18. Fewster-Thuente L, Velsor-Friedrich B. Interdisciplinary collaboration for healthcare professionals. Nurs Adm Q 2008 Jan-Mar;32(1):40-48. 19. Baggs JG, Schmitt MH. Collaboration between nurses and physicians. Image J Nurs Sch 1988;20(3):145-149. 20. Azhar S, Hassali MA, Izham MI, Khan TM. A Qualitative Evaluation of Nurses’ Perception towards the Role of Pharmacist in Healthcare Setup in Pakistan. Health Med 2010;4:71-76. 21. Friesner DL, Scott DM, Dewey MW, Johnson TA, Kessler ML. What types of nursing facilities are more likely to adopt a pharmacist’s medication review recommendations? Consult Pharm 2013 Aug;28(8):490-501. 22. Fairbanks RJ, Hildebrand JM, Kolstee KE, Schneider SM, Shah MN. Medical and nursing staff highly value clinical pharmacists in the emergency department. Emerg Med J 2007 Oct;24(10):716-718. 23. While A, Shah R, Nathan A. Interdisciplinary working between community pharmacists and community nurses: the views of community pharmacists. J Interprof Care 2005 Mar;19(2):164-170. 24. Khan MU. A new paradigm in clinical pharmacy teaching in Pakistan. Am J Pharm Educ 2011 Oct;75(8):166. 25. Hughes CM, Lapane KL. Pharmacy interventions on prescribing in nursing homes: from evidence to practice. Ther Adv Drug Saf 2011;2:103-112.